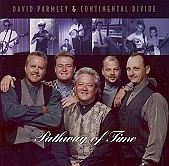 Bluegrass you can sink your teeth into, David Parmley & Continental Divide team up to get you moving. From the hard-to-resist stomp of album opener "Without Her In My Arms" to the ballad "Wake Up". And Through the old time-ness of "Thirty-Two Acres of Bottomland", Parmley & Continental Divide create a modern bluegrass record that sounds perfectly at home in the 30's, but fresh and alive enough to give any other bluegrass band around a run for their money. This is what bluegrass is all about, strong songwriting and even better playing, performed without flaw, and played with heart and soul. I'll give it an A.